It's 4 p.m. and chances are you're wondering what's for dinner. Again. If you'd started a slow-cooker meal this morning, you'd have the answer. "The best thing about slow cookers is that you fix a meal, walk away, and it's ready when you want it," says Kitty Broihier, MS, RD, and co-author of Everyday Gluten-Free Slow Cooking. After a long day or a tough workout, it's hard to muster the motivation to make a nourishing meal. Most of our slow-cooker dishes are meals in themselves, and they require little fuss to prepare. Even better: Slow cookers simplify cleanup, a big plus for busy people. Didn't plan ahead? Fish cooks quickly, so it can be ready for lunch or dinner even when you don't get a head start. Salmon is brimming with omega-3 fats, the kind that tamp down inflammation and play a role in joint and muscle pain. Omega-3s also get kudos for helping reduce the risk of heart disease. This zesty, no-carb dish gets its zip from cumin, coriander, and turmeric: spices with antioxidant properties that protect your cells from everyday damage. No salmon? Halibut and cod fillets work just fine. Marinate the fish the night before or in the morning. Pork tenderloin has no bone and very little fat to trim. It's also a zinc powerhouse, and one serving provides 20 percent of the suggested daily intake for zinc, which regulates blood sugar levels. Pork contains thiamin, too, which insures your muscles and nervous system work properly. 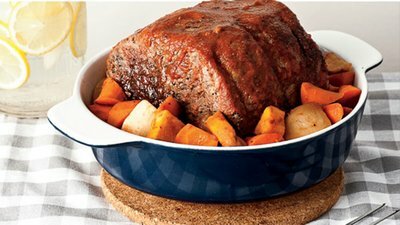 Lower-cost cuts of beef are well suited to slow cookers, since they require longer cooking times at low temperatures, which also allows the flavors to blend better. As for nutrition, root vegetables contain beta-carotene and other carotenoids, which are the nutrients that give orange produce its bright hue and serve as the raw materials for the body's production of vitamin A. (If you're watching your carbs, you can omit the veggies). And there's no shortage of iron here, with nearly 60 percent of your daily target in one serving. Iron is especially crucial for active women, since a shortage of it can lead to fatigue, and it helps form the part of the red blood cell that ferries oxygen around the body. Peanut-butter fanatics will love this delicious slow cooker dish. Peanut butter lends creaminess and great taste, along with heart-healthy unsaturated fat, niacin, and vitamin E. It's also the primary reason this entrée supplies nearly 20 percent of your daily requirements for vitamin E, necessary for guarding against cell damage and supporting your immune system, and nearly half of your daily requirement for niacin, necessary to convert the protein, fat, and carbohydrates you consume into fuel your cells can use. Chicken contains choline, an essential nutrient that supports your heart, liver, and brain, and helps prevent neural-tube defects in early pregnancy; a serving of Thai Peanut Chicken supplies nearly 25 percent of your daily needs. You can substitute boneless chicken breast as well. This cholesterol-free vegetarian chili is high in fiber and low in saturated fat, a dynamic duo that keeps your blood flowing to your muscles and organs. Plus, one serving packs about one-third of your daily potassium need, which keeps blood pressure in check and your heart and muscles in working order. Quinoa, a gluten-free, easily digested grain with all of the essential amino acids you need to make muscle and other lean tissue, is also a source of fiber. Kidney beans supply protein and fiber, too, and they're loaded with manganese, a mineral your body requires to produce energy, make collagen, and help defend against cell damage. No worries about leftovers, as this chili freezes well.